Christoph Friedrich Blumhardt, Action in Waiting, Foreword by Rodney Clapp, Afterword by Karl Barth (Plough 1998). Christoph Blumhardt (1842–1919) was a German pastor whose Christian radicalism and emphasis on the living kingdom of God against bourgeois personal pietism and religion influenced theologians such as Karl Barth and Jürgen Moltmann. 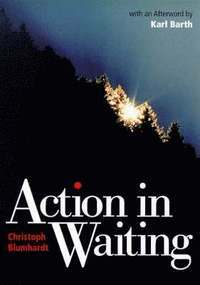 Action in Waiting is a collection of sermons that presents Blumhardt’s thinking in an easily accessible manner. This is not complicated theological speculation, but clear words about the all-embracing grace of the Kingdom of God. Blumhardt’s dialectical point is that only when we are ready to wait for the coming Kingdom of God are we truly able to act in the world here and now. Our religious practices and affiliations do not bring the Kingdom of God a bit closer: A comfortable Christianity will never change the world, says Blumhardt. Instead we must await the Kingdom in “active expectation”. Most importantly the Kingdom of God cannot be limited to the “church” or certain pious persons, but must embrace the whole world. The book can be freely download at Plough Publishing.